At a shop and/or an office, the customer queuing system with a guest slip printing is used normally. This application shows a simple solution targeting the customer queuing system. The Web server on the Internet is optional. But when it is available, it eases support and maintenance work especially for a company with multiple shops. 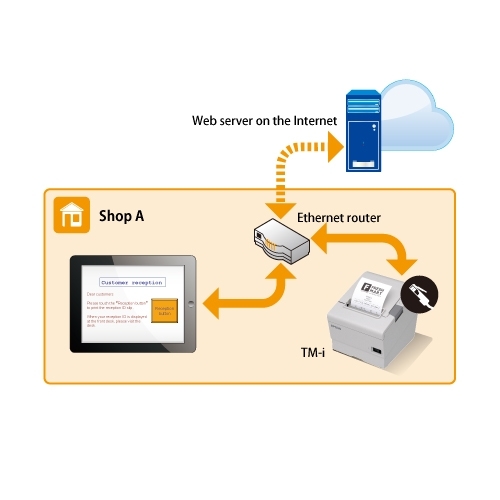 The customer queuing system application is a Web-based application, which means the application runs on a Web server on the Internet or at the shop locally including the built-in Web server at a TM-i. A tablet PC can access the customer queuing system application using a browser, which becomes the customer display to show a welcome message and the explanation about the customer queuing system and so on. A guest who visits the shop reads the message on the display, then pushes a button on the screen. At that time a guest slip with a guest (temporary) ID is printed out by a TM-i using Epson ePOS SDK without any printer drivers. On the operator PC screen at the shop (no image on the figure), clerks check the issued customer ID list, then select the younger guest ID when the clerk is ready to serve a guest. The selected guest ID will be displayed on a certain display or announced by the clerk. After finishing serving the guest, the clerk uses the PC screen to close the guest ID. Then the guest ID is removed from the issued customer ID list. When the reception application needs to be updated, a system administrator will place the new data/contents in the certain folder of the Web server on the Internet. Web Contents Update function on TM-i checks the files in the certain folder of the Web server on a certain schedule, then downloads and replaces the data within the TM-i. This eases support and maintenance work at the shop.